Tritonal is back on tour, which means you can catch them live at Hollywood Palladium on Friday 1st February 2019! Jump the queue and book your Tritonal at Hollywood Palladium tickets while you still can! The rumours are true! Tritonal is heading out on the road and bringing their incredible songs to a live stage. 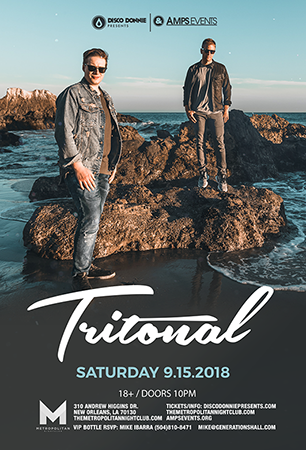 California fans will be getting the time of their life as Tritonal has now announced an exciting date will take place at the Hollywood Palladium! Tritonal never fails to give the crowd everything they have been waiting for and more… With an already successful tour, there's no doubt in mind that this night will follow in the same footsteps. If like Tritonal, you cannot wait for main event, then be sure to grab your tickets and ensure your Friday night is a memorable experience! Your favorite music, surrounded by friends – It doesn't get much better than that!